J & R Farm is located in Troy, VT right on the Newport City/ Troy line. The Farm produces fresh pasteurized cows milk curd. Curds are perfect for traditional dishes like Poutine, served on top of hamburgers and steaks, or just eaten alone. 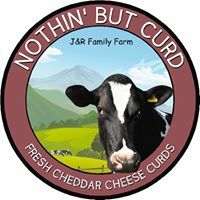 Curds are available at the farm stand from 7 AM until 6 PM. Honor system rule apply. Farm Stand open 7 AM to 6 PM. Honor System Rules.